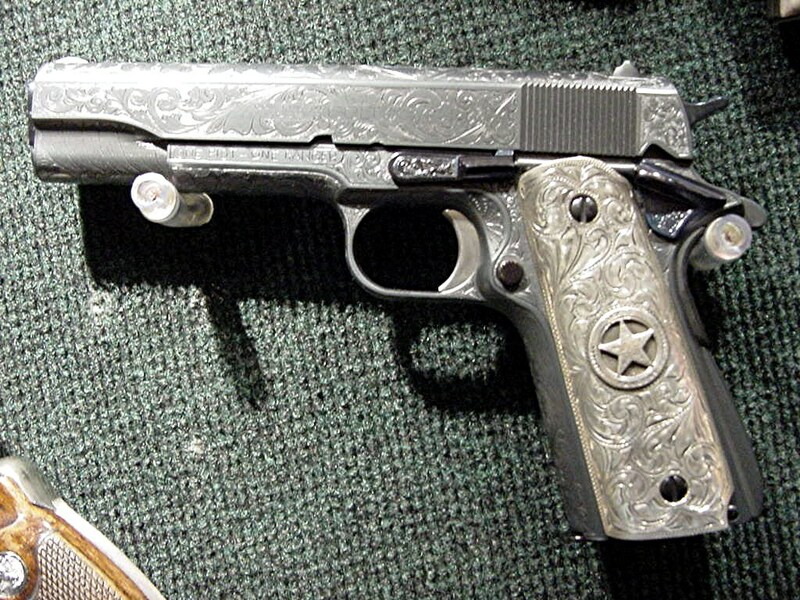 Since Texas Rangers began carrying Colt 1911 and Commander grips they have favored fancy ones. Originally they were obtained in Mexico from friends in the Mexican military or law enforcement. Now these sterling silver and gold grips command several thousand dollars and are very collectable. Chisholm’s Trail had gone to great lengths to bring some of the best designs back to life. One well known style can be seen in the 1987 action film “Extreme Prejudice.” In this modern western Nick Nolte becomes Jack Benteen the hard boiled Ranger sharing his girlfriend with Powers Boothe as Cash Bailey. 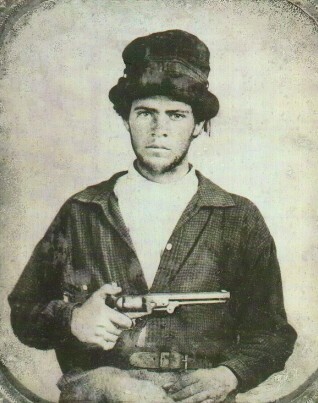 To prepare for his role, Nolte spent weeks with Joaquin Jackson one of the most famous Texas Rangers of his era. Nolte was even able to pass the Ranger firing course with Ranger Jackson’s help. 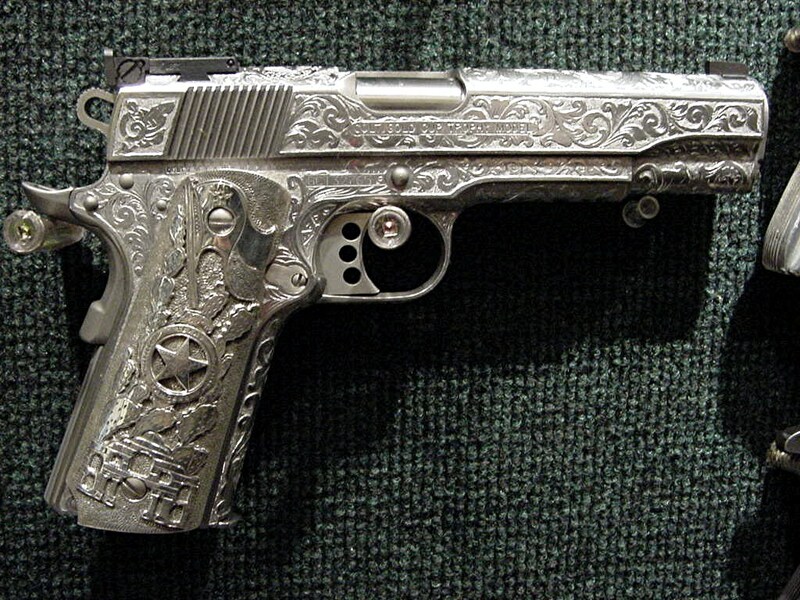 The movie grips were a dead ringer for Jackson’s Colt Commander grips with a silver body and gold accents. After several years Chisholm’s Trail has been able to recreate these stunning grips with Montazuma’s profile above an arched banner, with a horses’ head inside a horseshoe below. 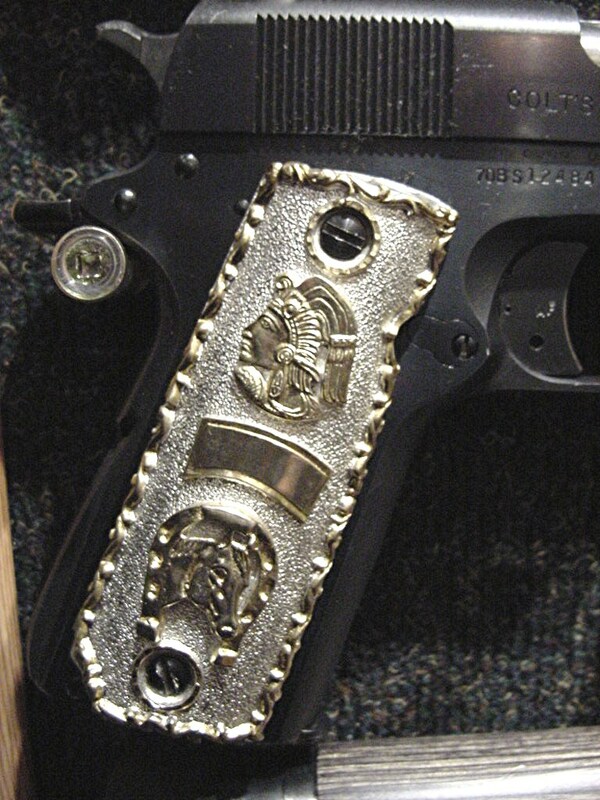 Our third set of TEXAS RANGER grips are cast from classic and deeply hand engraved originals. The traditional TEXAS RANGER badge is inletted into both sides. This set is also made from solid Sterling Silver and is currently $600. Each set has to be hand made and will take several weeks to craft. (price subject to change in raw silver cost). 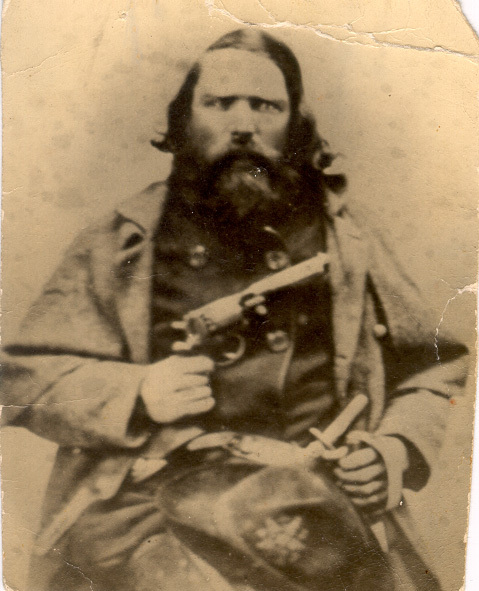 Terry’s Rangers were formed out of the turbulent times in the Civil War in Texas. This group became a serious fighting force for the Confederacy and feared by the Union forces. The original owner of this holster was more concerned with keeping his Colt secure while galloping rather than a fast draw. 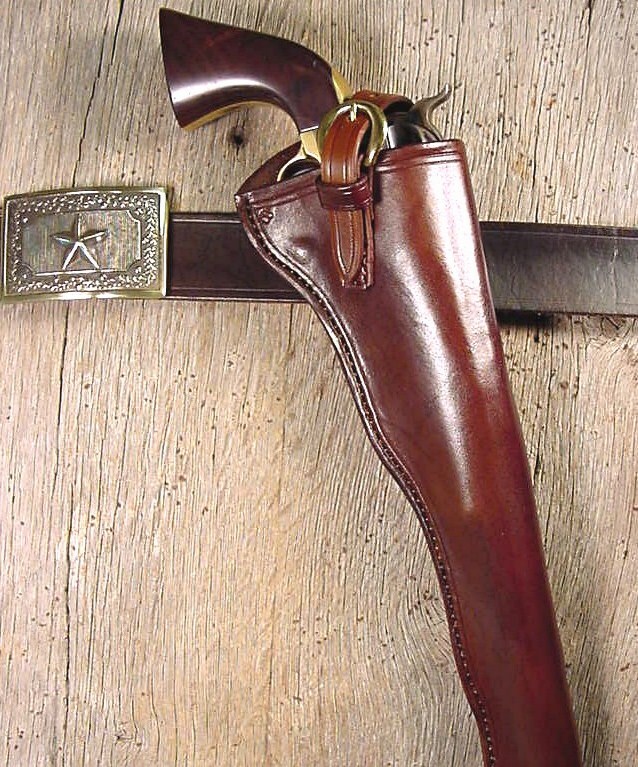 The Ranger holster can be sized to any single action or barrel length including 12″. Holster, 1 3/4″ belt, and correct reproduction buckle $274.95. 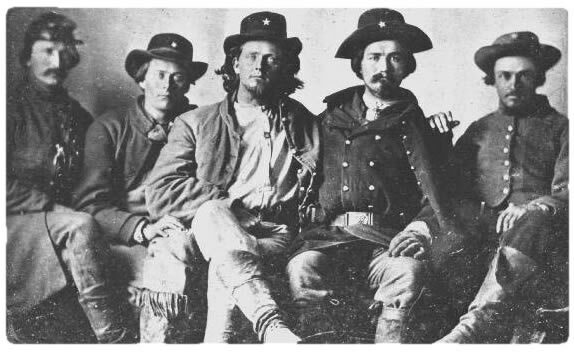 The 8th Texas Cavalry was known as Terry’s Texas Rangers. They were Texas volunteers for the Confederate Army under Colonel Ben Terry. They were most known for their actions during the battle of Gettysburg. Terry Rangers fought in 275 engagements in seven states in four years. This unit was known as the most effective mounted regiments in the Western area of the Civil War. Note the distinctive head gear on these Southern gentlemen.